Modern-day science has allowed us to prolong and improve life in astonishing ways, often by fending off germs and other invisible foes. But there’s no “immunity” to the inevitable signs of aging . . . or is there? In The Whole-Body Microbiome, the father-daughter team of Dr. Brett Finlay (a microbiologist) and Dr. Jessica Finlay (a specialist on aging) offers a different—and truly revolutionary—solution to the quest for the fountain of youth. While much has been written about bacteria in the gut, exciting new research shows that there are millions of microbes both inside our bodies—supporting our brain, teeth, heart, lungs, bones, immune system, and more; plus the microbes on our bodies, coming from the air we breathe and the things we touch all day long—cell phones and kitchen sponges, pets and doorknobs, and even other humans. These microbial “lifelong companions” have an immense impact on our daily health—and, as groundbreaking research is showing, they have the power to help prevent and reverse the most common age-related diseases. 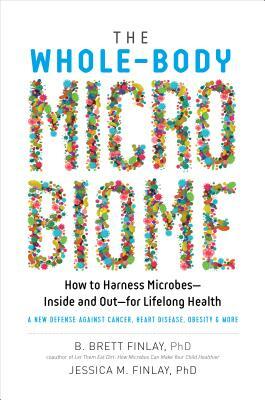 In this eye-opening new take on the significance of the microbiome, the Finlays offer empowering knowledge, surprising myth-busters, and simple yet effective daily tips that prove “dirty” is the new clean. Whether it’s by changing your diet, enjoying a glass of wine, getting more exercise, trading your antibacterial gel for good old soap and water, or spending more time outdoors, you can change your life today; so that you and your microbes live long—and prosper. B. Brett Finlay, PhD, is the Peter Wall Distinguished Professor in the Michael Smith Laboratories at the University of British Columbia. A leading researcher on bacterial infection, he has been studying microbes for over thirty years and published over five hundred scientific articles. A cofounder of the biotech companies Commense, Vedanta, and Microbiome Insights, Dr. Finlay is an Officer of the Order of Canada, the highest Canadian civilian recognition. He is a coauthor of Let Them Eat Dirt: How Microbes Can Make Your Child Healthier. Jessica Finlay, PhD, is a University of Michigan postdoctoral research fellow who specializes in environmental gerontology and health geography. With degrees from Queen's University and the University of Minnesota, she has won awards for her work and authored publications in leading health, geography, and gerontology journals. “Revolutionary . . . The Finlays offer practical, thorough, and sometimes shocking solutions that all of us can implement today, no matter what our age. . . . By helping our microbes flourish inside our bodies and in our environments, we can find preventative and curative care all in one.”—Dr. Mark Hyman, author of The UltraMind Solution and Food: What the Heck Should I Eat?